The Wapello County Sheriff’s office is looking for a woman in connection with a shooting Sunday. 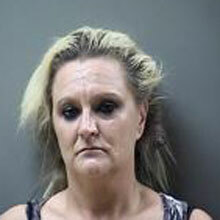 The sheriff’s department is asking for help in finding 40-year-old Danielle Lasley-Eakins of Agency. She is wanted in the shooting of a man who went to the emergency room of the Ottumwa hospital early Sunday morning with a gunshot wound. Lasley-Eakins is described as five-feet-five inches tall, 180 pounds, with hazel colored eyes and blonde hair. She is called armed and dangerous, and anyone who sees her is asked to call the Wapello County Sheriff’s Department at 641-684-4350.